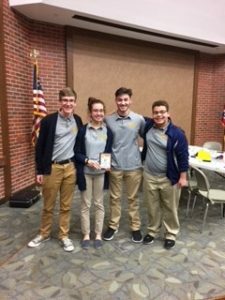 Every year, the Lawrence County ESC sponsors the Lawrence County High School Quiz Bowl League. Our county league is called the Ohio Valley Academic Conference (OVAC). 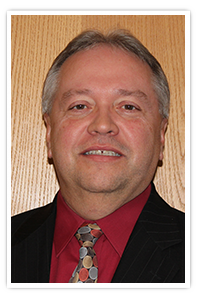 Participating schools in the OVAC are Chesapeake High School, Dawson-Bryant High School, Fairland High School, Ironton High School, Rock Hill High School, South Point High School, St. Joseph Central Catholic High School, and Symmes Valley High School. Regular season for these teams begins in December and runs through the end of February to early March. At the conclusion of the season, we here at the ESC give a “Regular Season Winner” award. This award is given to the school with the best overall record in the regular season. This year our regular season winner was Chesapeake High School with a record of six wins and only one loss. The Chesapeake team is coached by Mrs. Gina Allen. Mrs. Allen teaches Spanish at Chesapeake High School. The Chesapeake team was awarded a plaque for being the “Regular Season Winner” and Mrs. Allen was also awarded a plaque for being an “Outstanding Coach” this year. 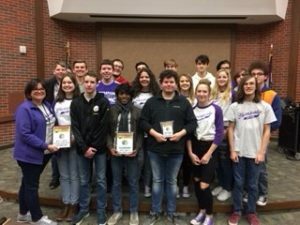 At the conclusion of the regular season, we also have a tournament sponsored by Ohio University-Southern and our very own Lawrence County Educational Service Center. Our tournament is called the Ironmaster. The Ironmaster was held on Tuesday, March 13, 2018 on the Ohio University-Southern campus. 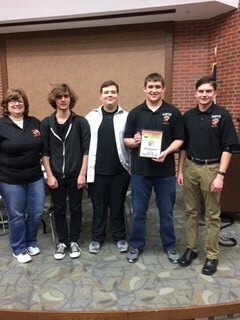 The Ironton High School Quiz Bowl Team was the winner of our 2018 Ironmaster Tournament this year. The Ironton team is coached by Mrs. Mary Frances Gunderson. Mrs. Gunderson teaches American Government and Modern World History at Ironton High School. 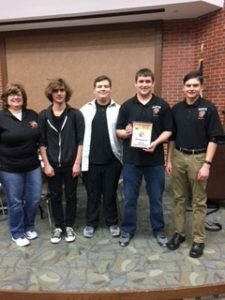 The winner of the Ironmaster (Ironton High School) along with our regular season winner (Chesapeake High School) advances on to the regional competition at Ohio University-Lancaster on April 21, 2018. 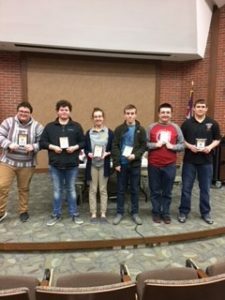 As part of our Lawrence County (OVAC) league, our quiz bowl coaches were asked to choose an outstanding player from their home team. These students would have been the high scorer for their team during the regular season along with showing exceptional team leadership skills. These outstanding students are our OVAC All Conference Players/Outstanding Player Award Recipients. Each of these outstanding players were awarded a plaque presented by the ESC. * Chesapeake automatically gets a bid to the Southeastern Regional Tournament in Lancaster, Ohio due to the fact that they are the regular season winners in a league with at least six team. Our Lawrence Co. league (OVAC) has eight teams from around our county. 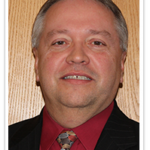 *Ironton, the winner of the Ironmaster Tournament, is also eligible to compete in the Southeastern Regional Tournament in Lancaster.